All of our school uniform is ethically traded and can be purchased from Thomas Moore in Exeter or online from My Clothing. Please follow the links below. We have tried to keep the costs of the uniform as competitive as possible, whilst ensuring the quality of the clothing. You can purchase uniform from either of the suppliers as we have found from feedback that certain items can be preferred from each. White, grey, navy or black socks or tights. Green gingham dresses may be worn in the summer. 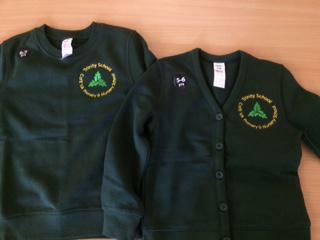 An optional fleece with the school logo may be purchased for use as a jacket for outside use only. Shoes - sensible smart black flat shoes. No trainers. Slippers - for indoors. All the research has shown that slippers help children to feel relaxed and contributes to positive learning! Wellies - for outdoors. A large proportion of Early Years experiences take place outdoors so wellies area vital part of the school uniform for our foundation stage children. Bottle Green PE t-shirt (logo optional) Navy blue/black shorts or tracksuit bottoms in the winter. Plimsoles (Not trainers). Book bags with the school logo on and optional draw string bags for PE kits can also be purchased. Should be neat, tidy and of conventional style appropriate for children of school age. Long hair must be tied back. Maximum of one pair of stud earrings. A watch is allowed, but no other jewellery permitted. No temporary tattoos, make up or nail varnish should be worn. ALL ITEMS MUST BE LABELLED AND NAMED PLEASE!